Lock in a great price for Hotell Hamngatan 27 – rated 9.5 by recent guests! The room was very good, breakfast was great. The staff made every effort to make us welcome. They were friendly, helpful and ready to insure a pleasant stay. The location is near good restaurants and great walking trails to walk off the meals. We will return when in Falkenberg. Very stylish hotel in a central location to explore lovely Falkenberg. I wish I would have been able to stay longer. 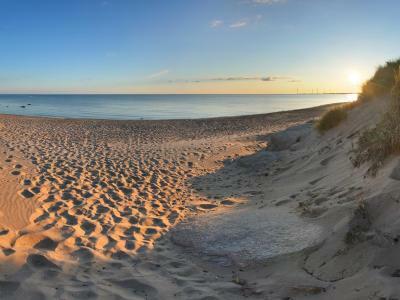 A lovely hotel next to the water of Ätran, more or less in centre of Falkenberg. Very accommodating, service minded and friendly owners and staff. Wonderful beds, nice and clean rooms. Delicious breakfast. Free parking just outside. Have stayed here on two occasions and had the same pleasure both times. Definitely to recommend! More or less everything suited us and was really good. Very friendly staff, clean rooms, tasteful breakfast and a nice outside garden on the backside to sit in. Perfect with free parking just outside the hotel. I will definitely recommend this to our friends and others. Kind staff and very nice housing. Our room was in excellent condition. Great location with walking distances to the whole city area. Can highly recommend this place! Wonderful hotel with care for the detail. We had a great stay and would have loved it to be longer. We very much enjoyed our chat with the owner where we also got great tips about where to eat and what to see. We can only recommend this hotel! A nice, classic, and cozy hotel. The breakfast is lovely. One of our top picks in Falkenberg.Offering a terrace and views of the garden, Hotell Hamngatan 27 is located in Falkenberg in the Halland Region, 18 mi from Ullared. This hotel is in a seahouse next to the Ätran River. Rooms here feature exposed wooden beams and classical style decor. Each room is equipped with a flat-screen TV and a tiled private bathroom. 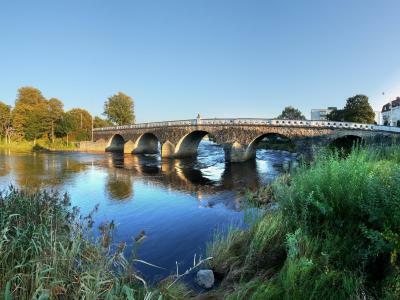 Views of the river, garden and the old town can be enjoyed from the hotel. Breakfast is available each morning and can be served in the garden if the weather permits. Free public parking is possible around the hotel. Halmstad is 21 mi from Hotell Hamngatan 27, while Varberg is 17 mi away. The nearest airport is Gothenburg Landvetter Airport, 53 mi from Hotell Hamngatan 27. When would you like to stay at Hotell Hamngatan 27? This single room features a flat-screen TV, a fridge and views of the garden or the Ätran river. This double room features a flat-screen TV, a large bathroom and a views of the old town or the Ätran River. Extra beds can be accommodated in some rooms. This double room features a flat-screen TV, fridge and views of the Ätran river. This king room features a flat-screen TV, a large bathroom and a views of the Ätran River. Styled with classical furnishings, this suite features a bathroom with bath and shower, a fridge and a river view. Please note that this room has space for 2 extra beds. 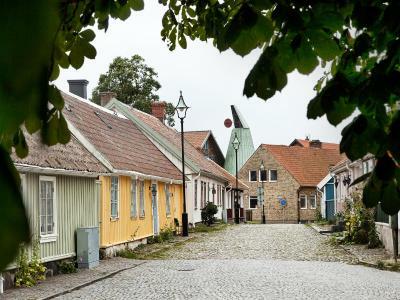 This small family-owned hotel is located in the Old Town part of central Falkenberg, just at the brink of Ätran. Hamngatan 27 is new-built in a Q-marked harbour storehouse from 1906. Our rooms are tastefully furnished and most of them have a view of the river beneath. All of the rooms are endowed with flat screen TV, free Wi-Fi, fridge and spacious bathrooms. As we open in the end of June we are currently limited in our ability to answer calls. Feel free to contact us via email, we speak Swedish and English. House Rules Hotell Hamngatan 27 takes special requests – add in the next step! One child under 6 years is charged SEK 95 per night when using existing beds. All children under 2 years are charged SEK 295 per night in a crib. All children under 16 years are charged SEK 475 per night for extra beds. Any additional older children or adults are charged SEK 475 per night for extra beds. Hotell Hamngatan 27 accepts these cards and reserves the right to temporarily hold an amount prior to arrival. If you expect to arrive after 17:00, please inform Hotell Hamngatan 27 in advance. Please inform Hotell Hamngatan 27 of your expected arrival time in advance. You can use the Special Requests box when booking, or contact the property directly using the contact details in your confirmation. Very positive. Very nice hotel. Friendly staff and great breakfast. Can't really think of anything. Perhaps one small thing then and that's the plastic cover under the sheets in the beds which more or less all hotel have these days. I understand why it's there, but I don't like it since it's taking away a part of the pleasure sleeping in a nice bed.. Lack of english channels on tv. Lack of aircon. It was exceptionally hot weather. Yes, breakfast was good and the bed great! Got an upgrade. Breakfast included homemade cereal. They have excellent service for people arriving late in the evening. That the breakfast didn’t have any warm food. No bacon or scrambled eggs and so on. loved the rooms and the bathrooms. Perfect bed and great breakfast.